Soon after we met, my future to be wife said, “I love you”. That moment had all the ideal romantic overtones one could ask for… us out in the forest, a moonlit summer’s night. Being the bubble-busting bum I am, I replied with something like, “What do you mean by love? What’s love?” Frankly, the word had lost its magic after my ex-wife dumped me the year before (1). This word has piqued my curiosity again, now that my sons are dating. The word love offers a good example of the iffy nature of words, names, and language over all. Many words are synonymous with love. The most synonymous, in my view, are the simple words need and like. I can say I love, like or need ice cream, sunny days, you, everyone. Each of these words, like, need, and love work equally well. Not surprisingly, my thesaurus doesn’t see it that way. Go ahead and take a look at yours. Generally, more passion (emotion) is associated with love than with like or need. This shows how loose, if not outright contradicting, language can be. It enables us to rationalize life anyway we wish. Seeing love and need as fundamentally the same thing makes this more difficult to do. It brings the whole issue down to the need, and need’s source spring fear — the bed rock of emotion. Love, I know, carries a special meaning of which we are all fond. In the special meaning we sow the seeds of hypocrisy, however well intentioned we may be. 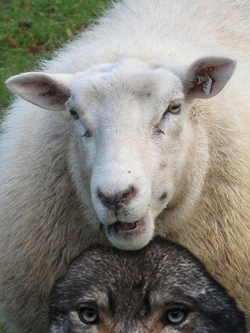 To say love is simply the wolf of need in sheep’s clothing sounds very cynical at first. We want to convey a special magical, mystical, spiritual meaning, all the way from we love God and God loves us, down to love of friends and family. This is where the inconsistencies enter in. It is in a way, to paraphrase chapter 1, The love that can be spoken of is not the constant love. A ‘truer’ love must be non-directional, by definition. Thus, without a profound sense of impartiality, love can only refer to some aspect of need. Consider these correlation pairs (upper left). The active, or yang, are on top; the passive, or yin, are on the bottom. The word love, as it is often used, correlates more to the active side; ‘truer’ love would correlate more to the passive side. These can be read in a clockwise direction. For example, the first set reads thus: need rushes love; love waits need. The next set reads: life takes death; death gives life. To make sense of these connections, it probably helps to have your mind like that of a fool – how blank!, as chapter 20 puts it (2). It may help to ponder the qualities that the ‘active yang’ words share with each other. Now, compare all this with the qualities that the ‘passive yin’ words share with each other. Need (active / yang) =rush=life=take=new=stirs=war =bias=something=fill=energy=burn=dream=excite. Love (passive / yin) =waits=death=give=old=calm=peace =impartial=nothing=empty=time=quench=reality=bore. (1) I was totally attached, or loyal, depending on how you look at it. I doubt I’d have ever left her. Thankfully, she had the good sense to know we were not the match made in heaven I’d talked myself into believing we were. I’ve thought for a while that the word “love” damages the fidelity of words, even before I knew of taoist ideas. More so than any emotion or concept, each person carries a unique perspective on what love means, and each definition contains numerous complex variables. 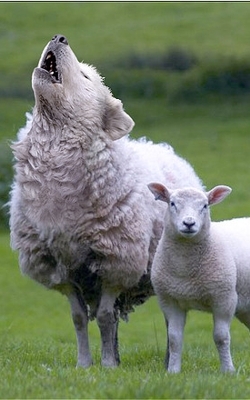 I was amused and impressed you found a photo of a wolf in sheep’s clothing, or did you have to photoshop it yourself? cool post. I’ll be back to finish reading later; my need for sleep is rushing me off the ‘net.